Today I bought a “new to me” GPS unit that I found on Craigslist. 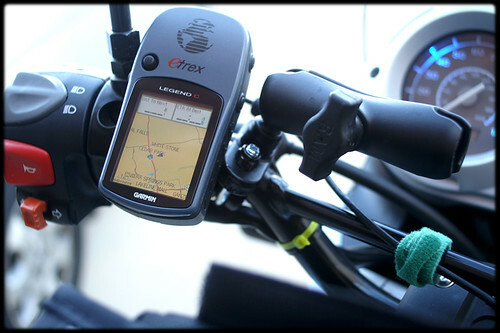 It’s a Garmin eTrex Legend C, which is similar in appearance to my old eTrex Legend, but has some important advantages. First, it’s got a color screen which is much easier to read in daylight. Although it is has less pixels, it presents the data better and the scrolling is much quicker. Another plus is that it uses the same bike mount as my Legend so I can just swap the backplate instead of buying a whole new one. A huge advantage this unit has over my old one is that it has a mini-USB connection. This means I can connect it to my computer to transfer data back and forth easily. My old Legend had a serial connection only, and who the heck has a serial port on their computers anymore? The USB connection also gives the Legend C its biggest advantage–the USB cord is used as a power source. I routed a USB cable up to the handlebars and now the GPS has unlimited juice. No more worrying about battreries! FYI, the other USB cable is routed up into the tankbag, and I can plug my G1 into it. I’m still learning all the new features on the new GPS but there appears to be tons more fun stuff plus more memory for maps. 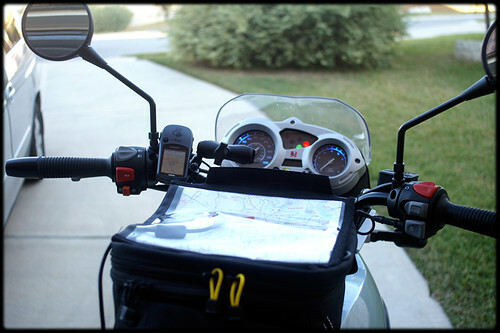 Although this model is an old one (discontinued and pretty much obsolete compared to modern GPS units), it is going to be perfect as a trip computer, which is one thing that my bike lacks. And all for only $30!